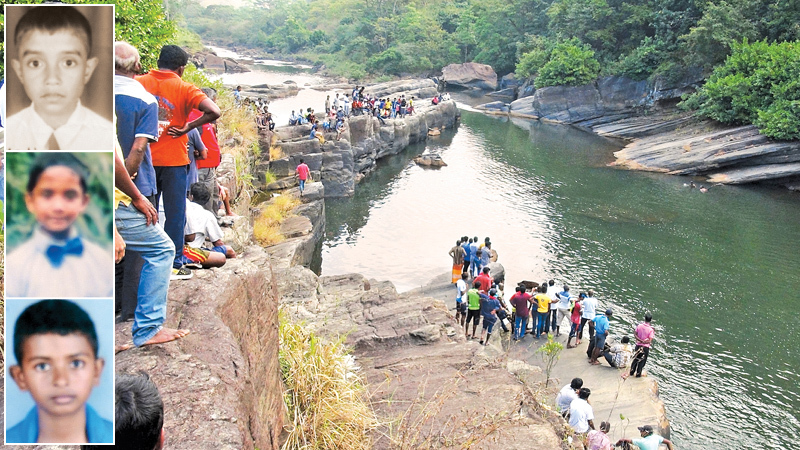 Three school boys who accompanied two other colleagues for a river bath near Dunhinda in Ethgala, Gampola on Saturday afternoon, drowned in the Mahaweli Ganga. The dead were identified as Themiya Supun Navaratne and Chamika Sandeepa Navaratne of Ethgala and Gayan Amitha Bandara of Udagama. They were all students of Saranapala Maha Vidyalaya. The other two students who returned to their homes had kept the deaths a secret until the parents of the missing boys went in search of their children. They had informed Gampola Police about the missing children yesterday morning. 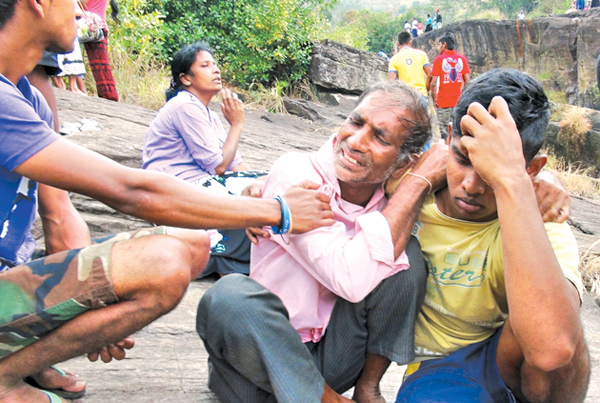 The Navy divers summoned to search for the missing boys in the Mahaweli had traced the bodies inside a big hole like a dungeon and recovered them from the river bed. The bodies were sent to the Nawalapitiya Hospital for an autopsy. meka harima awasanawantha siduweemak. Dinapathama wagey mey kanagatudayaka puwatha ahanna labenawa..Wedihitiyoth mewata waga kiyanna oney!!!! Parents and friends should explain risks of getting into water in unknown places. These are temptations of young boys. I had a similar nasty experience in school days. . One among three of us was drowning when we went to learn swimming in a lonely spot in an oya after O.LClass . For a moment I was in panic , I thought my friend is finished and my brain froze. Fortunately my other friend shouted in panic for assistance, help came and we survived. The lesson I learned is never get into water unless you have people nearby to assist you. Ask about the safety of the place from people of the area.